In anticipation for this weekend’s Skate Austin (also known as Bluebonnet Open), Figure Skaters Online was delighted to have the opportunity to interview Amber Glenn, 14, the 2014 U.S. Junior National Champion, who will be competing as a senior for the first time during this event. Amber has recently been named the overall winner of U.S. 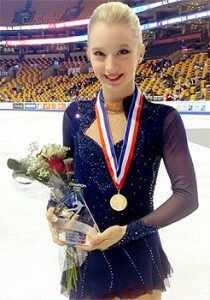 Figure Skating’s Athlete Alumni Ambassador Award for volunteerism. She won a bronze medal in her ISU Junior Grand Prix debut in the Czech Republic last fall and competed this year at the ISU World Junior Championships in Bulgaria, where she placed seventh. Figure Skaters Online thanks Amber for taking the time to answer these questions and wishes her the best of luck at Skate Austin and in her senior debut season. 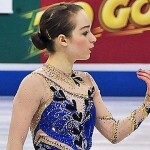 Figure Skaters Online: You have stated that you are going to be making the transition this year from junior to senior, what are some specific things you’ve been working on to make that transition easier and is there anything you’re nervous about with regards to joining the upper echelon of skaters? Amber: Other than working on bringing up my program component score [PCS], I find that continuing my normal training plan is what is best. As far as being nervous about joining the upper echelon of skaters, I am slightly but more than anything I focus on myself, and what I need to do to do my best. Figure Skaters Online: What are you most looking forward to in the year ahead and can you tell us anything about the programs you have planned? Amber: I am most looking forward to debuting as a senior lady. My long program has been choreographed by Rohene Ward. It is fierce and strong. My short program style is more elegant. I like the contrast of the two. 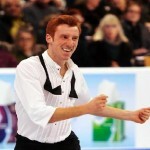 Figure Skaters Online: What was it like working with Rohene Ward on the choreography of your programs and why did you choose him as your choreographer? Who picked your music and why? Amber: We used Rohene Ward for my long program. He is an amazing artist. He gives you everything he’s got! It makes me want to give him everything that’s in me. It was an honor to work with him and I look forward to doing it again. I chose him because I have been impressed with his work. I like that he has so much talent that he was able to do some of the jumps with choreography and transitions with me. This year, I choose my music with my coaches. It was a group decision. For short, we chose David Garrett’s “You Raise Me Up” and for the long, we talked to Rohene and agreed that using a piece that I had skated to as my short program my first year junior was best. We mixed “El Conquistador” by Maxime Rodriguez and Benise’s “Aranjuez.” I feel like it’s more “me” and a good way for Rohene and me to start this, hopefully long and successful, journey together. Figure Skaters Online: This year at U.S. Nationals, you skated two solid programs to go on to win the gold medal. What were some of the things you can take away from that result? Amber: The biggest thing I can take away is that if you put in the hard work, when it’s time to compete, you can trust in the training. Figure Skaters Online: Can you tell us a little about your coaches, Ann Brumbaugh and Ben Shroats, and how they help you individually as a skater? Amber: Well, Ann Brumbaugh has been my coach since the first grade! She saw talent in me and potential before anyone else. Not only does she coach me on ice, she has been a part of who I am today. When you spend this much time together, you naturally become a part of each other. She’s like my rink mother, not a skate mom, but my rink mom. Someone that takes care of me and my skating. She makes sure that I do my work and monitors my training. Ben Shroats joined the team when I was 9, I believe. I took harness lessons from him on my double axel. He became a full-time part of my team when I was Novice. He’s like my rink dad or big brother, making sure I stay on track. While he can be relaxed and chilled, he can also turn up the heat when needed. I can completely rely on him to be organized and consistent. Figure Skaters Online: What are your goals for the first competition of the new season at Skate Austin, June 13-14, where you will debut your senior programs? Amber: My goal for Austin is to improve my PCS score while maintaining my level of difficulty. Figure Skaters Online: What has it been like trying to balance both school and skating, especially as you progress both in the classroom and on the ice? Amber: It takes a lot to balance them both. I rely on my mom to help me with my schedule and making sure I’m on track on and off the ice. Figure Skaters Online: What drives you through the bad days and helps you continue pushing yourself even when the going is rough? Amber: Everyone has bad days from time to time. The best advice I can give someone is to back off and remind yourself why you started skating to begin with. You have to truly love this sport to make it through the bad times. Figure Skaters Online: If you weren’t a figure skater what do you think you would want to be doing and do you have any thoughts about what you might want to do after your competitive career is over? Amber: If I weren’t a figure skater I would be doing some other type of individual sport because I am a very competitive person. After my skating career is over I would like to go into sports psychology to help others achieve their dream. Figure Skaters Online: Who were the skaters that you most enjoyed watching during this year’s Olympics? Amber: I enjoyed watching [Meryl] Davis and [Charlie] White, Jason Brown, Carolina Kostner, and Felicia [Zhang] and Nate [Bartholomay]. Figure Skaters Online: What is your favorite program from skating history/one that has always amazed or inspired you? Amber: That would be Sarah Hughes’ 2002 Olympic freeskate. Figure Skaters Online: If you had to compete in another discipline of skating (pairs or ice dance) who would you want your partner to be? Amber: Probably be pairs, I couldn’t not jump. It would have to be Simon Shnapir because I’m not short.